Milagro Select Barrel Reserve Silver Tequila ($69.99 a 750-ml. bottle), from William Grant & Sons, is the newest offering in the ultra-premium Select Barrel Reserve line, which includes a Reposado and an Añejo. The new variety is made from 100-percent estate-grown, hand-picked blue agave that’s cooked in traditional clay ovens at the Tequilera Cielito Lindo in Jalisco, Mexico. 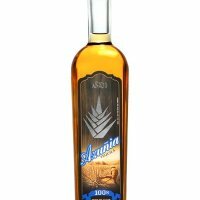 Before the 40-percent abv Tequila is packaged in a hand-blown crystal bottle, it’s mellowed in new French single oak barrels to create its subtle aromas of vanilla and oak. “Our new Silver Select Barrel Reserve affords us the perfect bride between our super-premium line and our ultra-premium Select Barrel Reserve expressions, and additionally addresses our consumers love of Silver at an exceptional level,” says John Bilello, managing director of Tequila Milagro . Milagro Tequila also offers two flavored Tequilas, Limón and Mandarina, that launched last year, as well as Romance, a dual-vessel bottle that houses Milagro Select Barrel Reserve Reposado and Añejo.